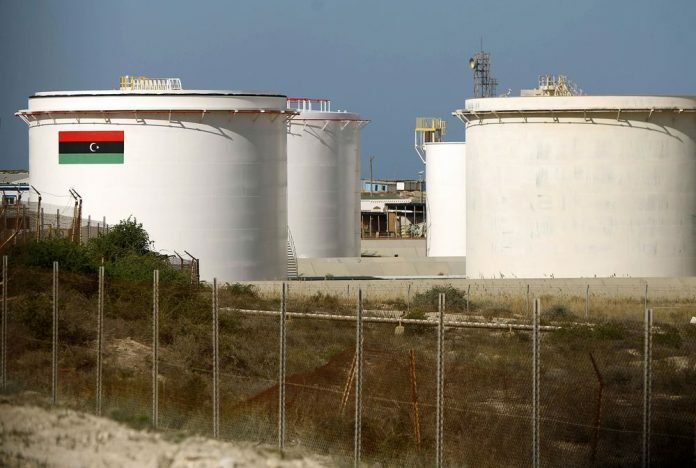 Libya Oil Field Halt Slows Exports, Sending Crude Prices Rising - The Maghreb Times ! Libya’s oil exports from the Mellitah terminal will be “modified” after protests disrupted production at the key El-Feel deposit for the first time in two months, putting the OPEC nation’s crude production at risk of a decline again. Crude loadings at Mellitah, the export terminal for El-Feel, will be “modified” after force majeure was declared on deliveries from the deposit on Feb. 23, the state-run National Oil Corp. said in a document obtained by Bloomberg. NOC said Saturday guards at the field were protesting over pay and other benefits. Force majeure is a legal clause protecting a party from liability if it can’t fulfill a contract for reasons beyond its control. Production at El-Feel, operated by a joint venture of NOC and Italy’s Eni SpA, was last disrupted for one day in December due to a power outage. The field has production capacity of 90,000 barrels a day but it’s not clear what output was before the outage. NOC officials were not immediately available to comment. Libya, a member of OPEC, was allowed to increase oil production while other nations in the group cut output to curb a global glut. The North African nation’s output earlier this month was 1.1 million barrels a day, the highest since June 2013, a person familiar said Feb. 15. Oil finished a second week of gains on Friday after news that El-Feel was shut and American supplies drained. Mellitah was set to load four cargoes this month, each holding about 600,000 barrels, according to a loading program seen by Bloomberg. One vessel was scheduled to be loaded Feb. 21 to Feb. 23. With a fragile political accord barely holding the country together, Libya faces an array of challenges preventing its return to the output levels of about 1.8 million barrels a day pumped in 2008. Pipelines and other facilities are targeted by armed factions and tribal groups jostling for political control and a share of oil revenue. El-Feel was briefly shut in August after an armed group closed its pipeline, prompting the NOC to declare force majeure back then. NOC Chairman Mustafa Sanalla said El-Feel guards were under the Ministry of Defence and it needed to respond to their demands. The shutdown and evacuation of employees from El-Feel came after the “deterioration of the security situation as members of Fazzan group from the Petroleum Facility Guards threatened workers, entered the administrative offices in the field and tampered with official papers of the field administration and firing in the air,” the NOC said Saturday.